The Auto Expo 2016 is here and once again, Indian car aficionados are all set to have a rendezvous with some exciting machines at the country’s largest-ever motor show. Among the assortment of cars put on display at this year’s Expo is an impressive range of models from Renault India. Spearheading Renault India’s charge in the ever-growing Indian car bazaar are new editions of two of its best-sellers – the Kwid and the Duster. Also on display are a set of exciting design studies that give us a glimpse of future vehicles from the popular French automaker. On this page here, we have compiled information on cars by Renault at Auto Expo 2016. Please don’t forget to bookmark this page and come back again as we will keep updating it as the details unfold. The entry-level small car from Renault India has been very successful with garnering a positive response from the Indian car buying lot. Currently, this rugged-looking A-segment hatchback is powered by an 800cc petrol motor that comes mated to a 5-Speed manual gearbox, and belts out a peak power-torque figures of 54 bhp-74 Nm. The Kwid, which has by now captured the imagination of car buyers with its mini-me Duster looks and a price tag that spells excellent value for money. 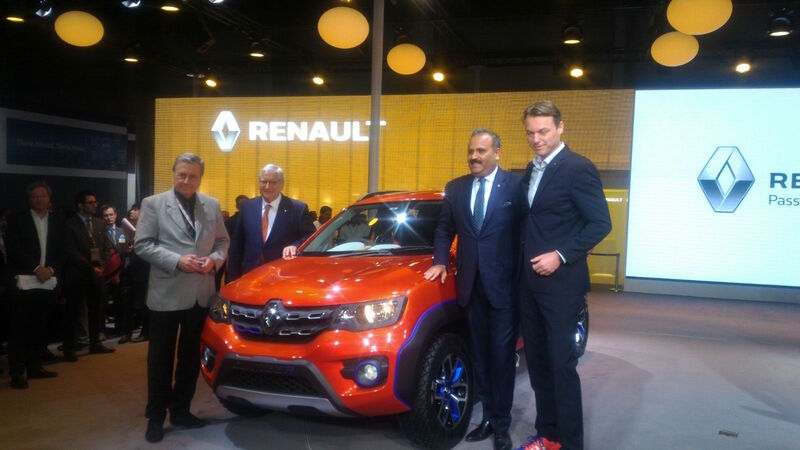 Renault has revealed two new variants of the production vehicle and two impressive concepts of the Kwid- named the Kwid Racer and Kwid Climber on 3rd Feb 2016 at the Auto Expo 2016. Renault has revealed the new 1.0 Litre engine models of the Kwid with better performance. It uses advanced 4-valve per cylinder technology coupled with DOHC layout for superior low end performance and better fuel economy at the same time. The Easy-R variant is the automated gear shift variant (AMT) with a 5 speed gearbox. It provides for a combination of stress free driving experience and high fuel economy at the same time. There is also crawl function to move forward or backward slowly even without depressing the accelerator pedal. Kwid Climber is a tall-boy off-roader with igh ground clearance, wider track width, shorter overhangs and improved tyres. It is meant for adventure seeking customers. 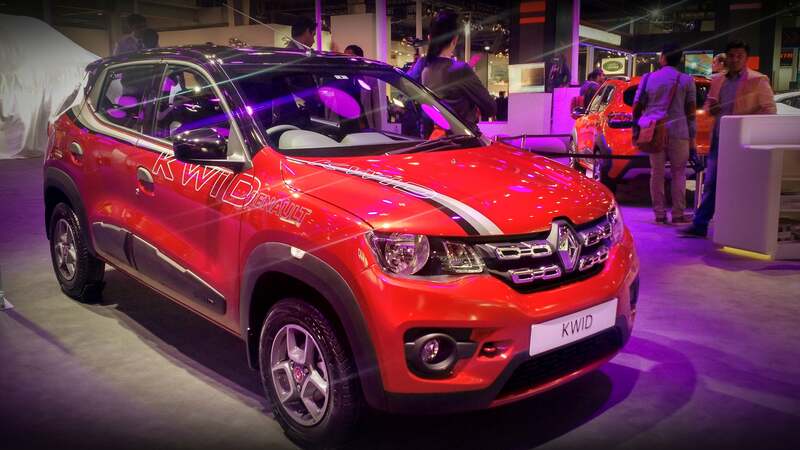 Kwid Racer however is designed with Renault’s racing DNA. It has sporty styling, low height and sporty design to appeal to speed-seekers. Showcasing the customizability of the Kwid hatchback, Renault India has displayed a specially accessorized version of the Kwid hatchback at the Auto Expo 2016. This modified Kwid carries several styling updates, the highlights of which are – chrome front grille, black & white decals that run along the shoulder line of the hatchback, a black roof, blackened rear view mirrors and anthracite grey-painted alloy wheels. On the inside, the car’s cabin features a red panel on the bottom of the gear lever, red stitching and lining on the seat upholstery, a red and black carpet underneath the accelerator pedal. The interiors of the Lodgy World Edition feature orange accents and highlights on the center console, instrument cluster, HVAC vents, seats and floor carpets. The steering wheel has an exclusive “World Edition” lettering on one of the spokes. Please follow this link to our detailed story on the same. 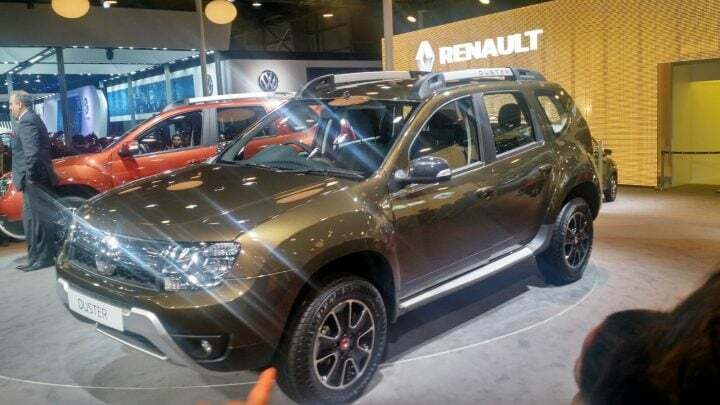 Renault has revealed 2016 new Renault Duster at the Auto Expo 2016. The new Duster provides more than 32 new features compared to the previous generation and will also come with an option of 6 speed Easy-R AMT automatic transmission for customers who seek freedom from clutch and gear operations. Some key new features include- new engine compartment, new front fascia, new roof rails, automatic climate control, eco mode, cruise control and a lot more. Find out complete list of features and details on the new 2016 Renault Duster here. 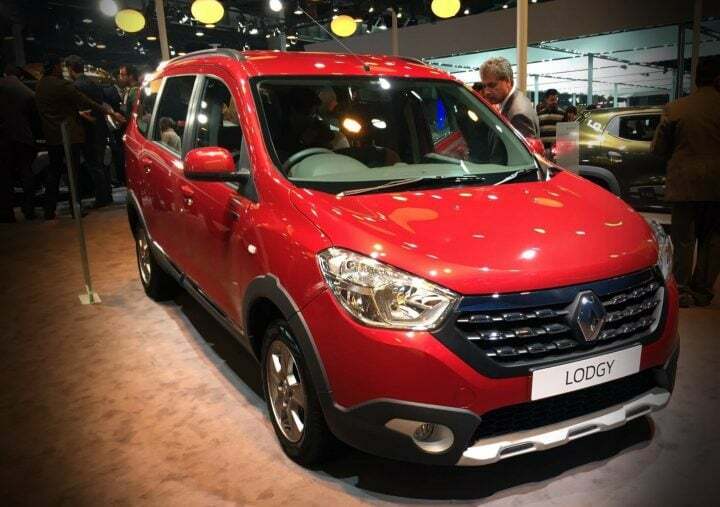 Also put on display at the latest Auto Expo is a modified version of the Lodgy MPV. Dubbed as the Lodgy World Edition, the exterior of this vehicle features a new Fiery Red paint job with white pinstripes, a roof mounted rear spoiler, and 15-inch alloy rims. The interiors of the Lodgy World Edition feature orange accents and highlights on the center console, instrument cluster, HVAC vents, seats and floor carpets. The steering wheel has an exclusive “World Edition” lettering on one of the spokes. All of these styling changes come together to enhance the appeal of this world class MPV. Also a part of India’s exhibits line-up of vehicles for- Renault At Auto Expo 2016, is an eco-friendly vehicle that has been christened as the Eolab. Essentially, the Eolab is a spacious plug-in hybrid that, Renault claims, delivers a fuel economy of 100 km/l. The Eolab has been constructed using a combination of steel, aluminium composites and has a roof made of magnesium. All this means that the Eolab tips the scales at less than a 1,000 kilos. Also, this green concept gets adjustable ride height, which helps in reducing the drag, thereby further enhancing the fuel economy. 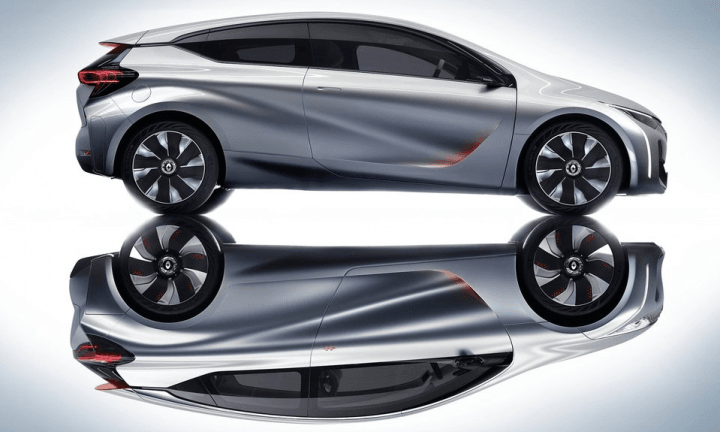 While the Eolab won’t get into production anytime soon, many of the technologies featured on this concept will trickle down to road-going cars towards the end of this decade. Apart from unveiling these promising products, the manufacturer also showcases all the models from its current portfolio. 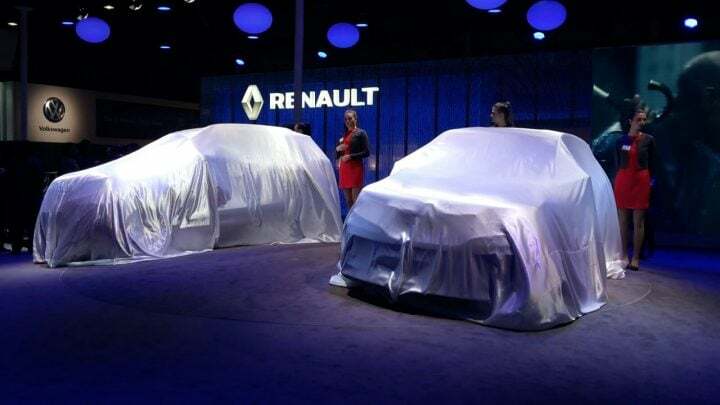 We are pretty sure that the advent of the refreshed Duster along with the introduction of the more powerful variant of the Kwid hatchback will boost the sales performance of Renault India. More details coming soon. Please bookmark this page and come back later for more updates.